I love the Bourjois nail polish remover pot! Definitely going to purchase the toe version haha! I need more RT brushes. I think they're fab! I just couldn't stand the smell of the L'Oreal Elnett Hairspray so I stopped using it, until I found out that there is an "unscented" version. It's not completely unscented but, much better than the original. The Soap & Glory scrubs are just the best, aren't they! I can't recommend Barry M polishes enough, they're brilliant. I don't get on very well with Batiste dry shampoo, which is a shame! great selection of products!! love barry m polishes! Big fan of Batiste and Liz Earle!! I have been ummming and ahhhing over the soap and glory scrub…will have to bite the bullet and give it a try! God, i am in love with that nail remover. Really worth the hype. Great products you have here. 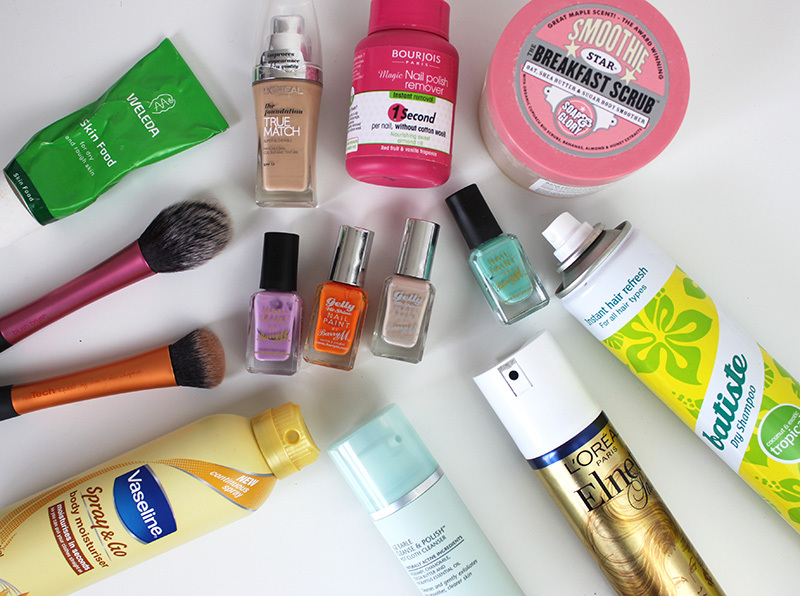 I have tried most of these and they are really worth repurchasing. I wholeheartedly agree with every single item! Especially the RT brushes and the vaseline moisturiser! Great picks <3 I've tries the Real Technique brushes they're amazing <3 and I really want to try the Loreal hair spray!